Eurobot is an amateur robotics contest open to groups of young people from around the world, organized in teams. These teams can be formed by students as part of their studies, by independent clubs or by non-profit organizations. A team must be made up of two or more active participants. Team members may be up to 30 years old, each team may have one supervisor for which this age limit does not apply. The aims of the contest are to promote public interest in robotics and encourage hands-on practice of science by young people. 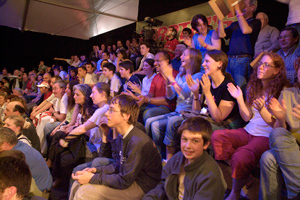 Eurobot is intended to take place in a friendly and sporting spirit. More than a championship for young people or a friendly competition, Eurobot is a opportunity to unleash your technical imagination and exchange ideas, know-how, hints and engineering knowledge around a common challenge. Creativity and interdisciplinary cooperation is necessary to achieve success. Eurobot values fair play, solidarity, creativity and sharing of technical knowledge. Eurobot takes place in Europe, but is open to teams from other continents. Countries with more than three teams interested in participating must organize a national qualification in order to select the three teams which will participate in the Eurobot finals. The selection will typically include the two best teams (in terms of competition score), but it is left to each national organization committee to agree on a possible alternative to competition for selecting its last team. For example, the third team can be chosen by a jury according to other qualities valued by the contest, such as: best concept, most creative, fair-play, etc. Note that for countries failing to establish a national qualification event, but with more than 3 teams registered to Eurobot, the refereeing committee will accept only three teams to the event, selecting them based on the order of submission of their pilot study. 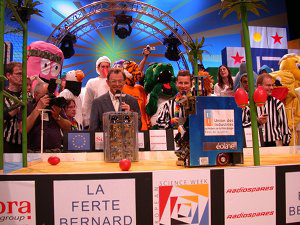 Eurobot was founded in 1998, on the strength of the French Cup of Robotics, following the constitution of a similar competition in Switzerland. To deal with the expansion of the contest and to maintain the original spirit of exchange and cooperation between the different organizers, Eurobot association was founded. You can find Eurobot association's statutes on our website www.eurobot.org. Individuals or organizations sharing our values are most welcome to support us who believe in the educational value of this experience and are themselves often former participants. Welcome to Eurobot, and have a nice adventure!